It is measures 34 inches by 21 inches with a plush height of about ¾ tall from your floor. It is constructed with a memory foam internal structure and short pile microfiber outer cover that are 100% polyester to water resistance and easy care and cleaning. This item usually ships within 3-4 business days of order being placed, please allow 3-7 business days after shipment for delivery in continental US. Please allow additional time outside of USA. Please allow 10 days for your order to arrive if you're in the United States. Outside of the United States may take up to 30 days. We source products from all over the world to bring you epic offers and the lowest prices. This means sometimes you have to wait a little longer to get your order but it's always worth it! Ordering from Einstein Deals is 100% safe and secure so you can rest easy. Your personal details are never shared, sold or rented to anyone either. Shop now. Enjoy now. Pay Later! With Afterpay. Buy what you want today, pay for it in four equal installments, interest-free. © 2019 Einstein Deals. All rights reserved. 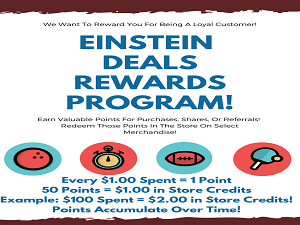 Einstein Deals Rewards! Shop with confidence knowing that your purchases are appreciated. Your loyalty and purchases earns you valuable points that you can redeem for anything in our store. Points that can be used to buy items!